Missionhill Cattery is located in the charming city of Kelowna, nestled in the Okanagan Valley in British Columbia, Canada. 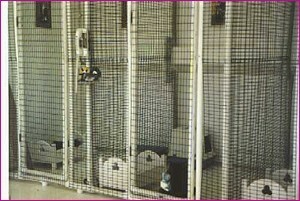 PandEcats.com has asked me to invite you to tour our cattery facility, and to share with you some of the tips we have about cattery construction in general. When our house was originally built, the area where our cattery is now located was just a crawl space off the basement with provision to expand it to a room with an 8 ft high ceiling. 15 years later we were glad we had the space for expansion. The cattery had to be part of our house. It had to be bright and cheerful. The cats had to be visible from the family room. The males would be confined, but not in a cage situation. 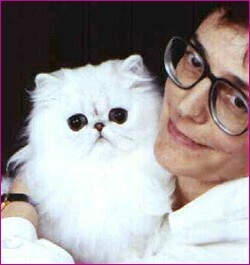 Females with young kittens would have an area to bring up their babies while they were being litter box trained. There would be plenty of free running space for those cats and kittens who did not need to be confined to runs, but who for various reasons were not allowed access to the main house. The cattery had to be easy to clean and disinfect. 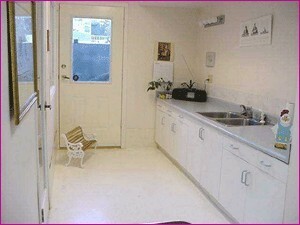 There had to be a separate room attached to the cattery for bathing and blow drying. An air exchanger was essential. A telephone would also be an added convenience. 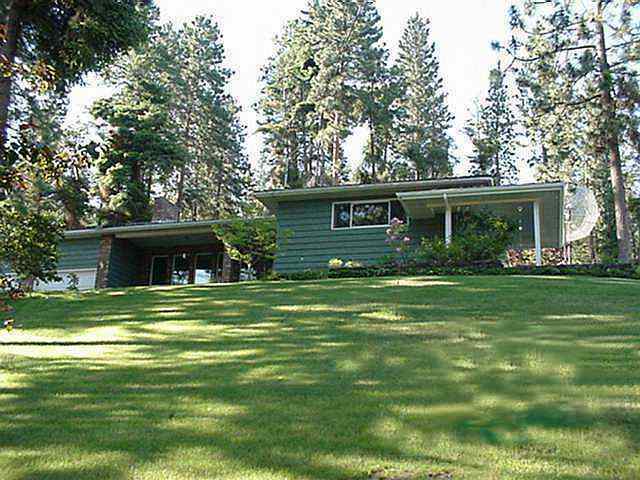 We began construction in 1991, doing some of the construction ourselves and contracting out much of the work to sub-trades. Double French glass doors lead from our basement family room in to the Cattery. 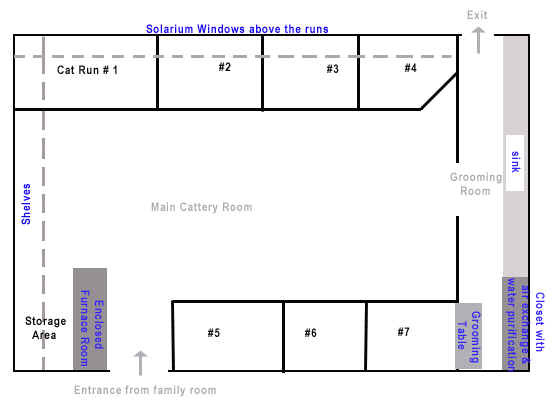 The cattery and grooming room together consist of an 836 sq.ft. area. The Main Cattery is a long room with 4 large runs on one side and 3 smaller runs on the other side, separated by a 9 ft wide corridor. At one end is the grooming room. 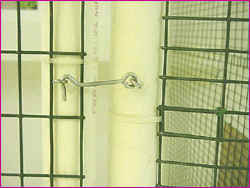 The Cattery Runs The runs are constructed with 1 1/2″ diameter PVC irrigation pipes available from your hardware store. 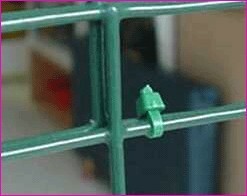 These dividers are easy to clean, may be bleached, do not rust and do not need painting. 90 degree couplers are used for corners and doors. 2″ x 1″ rectangular plastic coated wire is attached to the plastic pipes by means of vinyl snap ties. We have elevated the cages off the floor by means of “T” joint couplers. The reason for elevating them off the floor is for ease of cleaning. 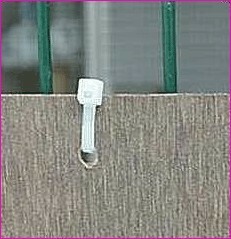 Small plastic snap ties were used to join wire to wire. 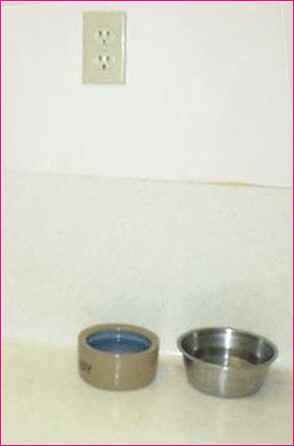 Larger snap ties were used to attach the wire to the pipes. Windows. All along one side of the cattery, above the larger runs, we have installed large solarium windows. These allow a lot of natural light into the cattery. Shelves are attached at various heights in every run so the cats can enjoy exercise and lounge time. 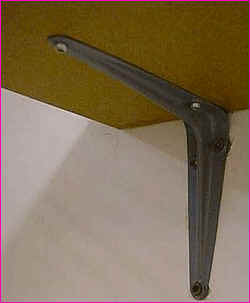 The shelves are supported by “L” brackets screwed directly into the wall studs. Kitten No-Climb Strips Initially we had a problem with kittens climbing up the wire and threatening to hurl themselves down if we did not let them out. We solved this problem by attaching 6″ wide arborite strips all along the perimeter of the kitten runs, about 18″ above floor level. This might be frustrating for the kittens but much better for our peace of mind. 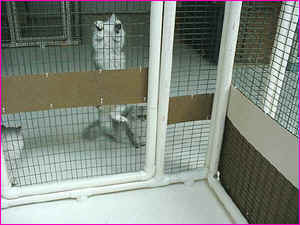 You can see an older kitten climbing the mesh from the outside of the run where there is no protective strip. The arborite panel at floor level on the right of the photo prevents a male from spraying into the next run. 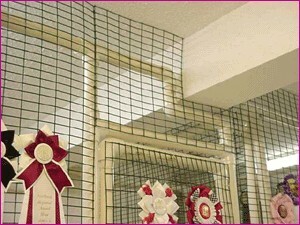 The kitten no-climb / no-spray panels are attached with the same style vinyl snap ties used to connect the panels of wire mesh together. The doors are hung by means of hinges. They are closed with hook and eye latches which are affixed to both inside and outside the door. 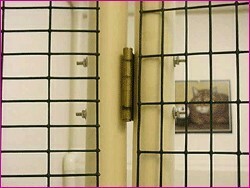 This way when we go into the cage to sit and visit with the kitties, we can lock the door from the inside. Each run contains a custom-made bed for the babies. Cattery Floor The cattery floor is covered with bleachable industrial grade linoleum. The lino goes 18″ up the wall and all wall plugs are set above this height. This is a precautionary measure in the event of cats spraying and electrocuting themselves. 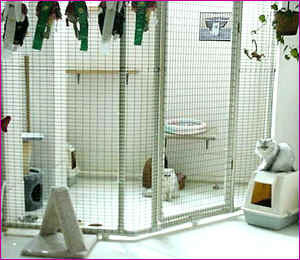 The Grooming Room At far end of the main cattery is the grooming room. The door to the grooming room is mainly glass and there is also a large window looking in to the grooming room from the cattery. All this glass prevents a feeling of claustrophobia and makes the room a pleasure to work in. 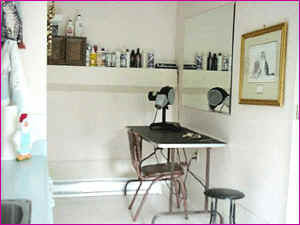 The grooming room is large enough to accommodate a table for blow drying, and a storage cupboard at one end. Behind the grooming table is a very large mirror which not only makes the room appear bigger and brighter, but is also useful for seeing both sides of the cat during grooming. There is a door in the grooming room which is an outside exit. The upper half of this door is glass to allow extra light in. Along one side of the grooming room there is a long counter top on both sides of a double sink with plenty of cupboard storage for towels, etc. Air Quality We also have an air exchanger system which is capable of heating the cold air intake in winter. 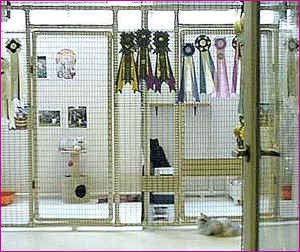 It also helps to keep the cattery free of bacteria and odors. 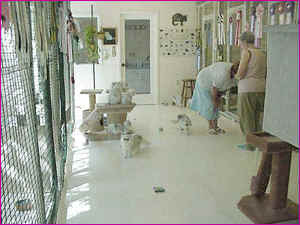 Music We have speakers installed in the cattery so we can have music while we do our chores. And the kitties like it too! We have found that this cattery setup works really well for us and there is little that I would like to change if I had to do it all again. I have enjoyed sharing our cattery with you. I hope you have enjoyed your tour.